Lar & Kim were over last nite -- I like Wed. night as it gives me Thurs. off before I get my hair done on Fri. But we'll go back to Thurs. in a few weeks. So far this A.M. I've changed my bed & started a load of wash. Dale won't be home for lunch -- pizza lunch meeting they have monthly -- so I might walk over town after the Schwan Man comes. Another prescription needs to be filled. I miss D & K as there is no place to browse. The owner of the Market St. Cafe bo't the bldg. but didn't announce any plans. At least part of the rumor came true. We were suppose to meet the "gang" last Fri. but Ted. B. had a funeral; Ted S (Ohio) wasn't feeling well so no get-together. Fri. A.M. the phone rang & it was Warren saying how about lunch -- we'll come to Warren. We went to "The Cafe" & they really enjoyed it & we were there from 12:20-2:45 & we did a lot of talking. It was fun. They had been to Pittsburgh to see "mama Mia" which they loved & didn't get home until 2:30 A.M. In Sept. they go to Fla. for their family get together at Disney World. Karen has a time share apt. there. Later in the month they go to Worcester, Ma. He'll perform a wedding for a relative's daughter. In a Congregational church whose pastor left. We make plants to get together Sept. 30. In yesterday's USA Today there is an interesting article by a rabbi "Clergy's Ego Can Undermine Faith". He mentions the decline of interest in the church. In the 70's organized religion was ranked higher by the public than any other institution. A recent Gallup Survey that people who had either "very much" or "quite a lot" of confidence in religion fell from 60% to 45%. One dissatisfied congregant express to me, "We assume you have all the answers that we don't have." He was surprised & answered "Being human, too, I don't' have all the answers, but here are some routes I have taken in looking for them & maybe you can try them, too." Clergy has doubts as well & people forget that. My comment. He said clergy should put aside robes & collars, etc & engage members in discussion on everyday matters we all enjoy such as sports & entertainment. That is the point of this. The 2 Teds are retired & when we are together they should forget their self importance & enjoy the day talking, joking & having a change of pace. AMEN!!! I'm anxious to hear how the boys like their new schools, etc. Isn't it fun being a parent -- the escapades & all. The Schwan Man just came. I noticed they had brats & decided to try them. They have a recipe: Brats Bake using hash browns, sauerkraut, brown sugar & brats cut 1" pieces. Sounds interesting. Also how to broil or pan fry. There aer new to me. I tired some once but I hope these will be tastier. Nyla Thelin Luvison died Mon. She was born April 9, 1957, one day before Dale. So sad. Leaves a husband & 2 daughters. This Fri. & Sat. are Warren's Sidewalk Days. I notice it is Thurs & Fri. this year so maybe I can see things this aft. I'm ready to read again so I'll go to the library. We've been watching & enjoying tennis on TV. We haven't gotten to Grove City Outlet yet, but we hope to in Oct. Bert will be going to NYC in Oct. so it will be easier to get away. We'll go on a Mon. Barb is a little concerned driving on 80 but she can do it. She's a good driver until she gets behind someone going 35 mph on the way to the Mall via Conewango. It upsets Dale when he gets behind a poky driver on the way home from work. This is the fast generation. It was nice walking to CVS & the library. Got another book by Catherine Coulter & a new author that looked interesting. Love & Money by Ruth Harris. 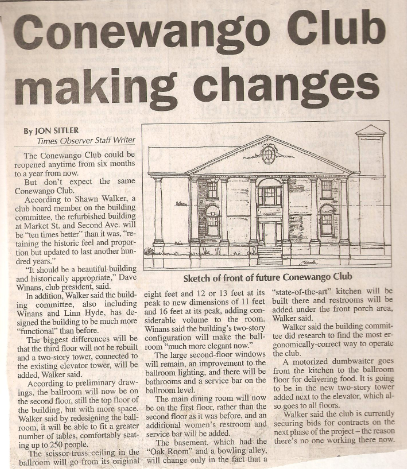 I heard on the radio that the Conewango Club plans to finish the first & second floors but not the 3rd floor. Will put on a domed roof -- I think I heard that. Kitchen in basement, library rooms & eating on 1st floor as befitting a men's club & the ballroom on the 2nd floor. Will rebuild both front & side porches with pillars. The ballroom gets a lot of use for wedding, etc. dances. Maybe they get it air conditioned. Larry & Kim have been there for hi school reunions & it's been very warm. Soon, I hope, I'll be sending you an early birthday gift Paul. I've had it for awhile. Something I saw that you might like -- I hope. That's all I'll say.